About this time last year, someone on my friends list posted this "52 Week Money Challenge". 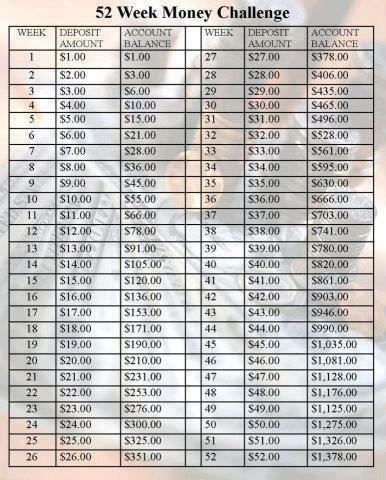 I think it originally started as a way to save for Christmas, but you could use it as a way to save for what ever you want. Our budget is tight; mortgage, bills, debt and improvements to an older home are our priorities. Still, it looked so doable, especially if we did it together. We did! We will be taking our $1378.00 to the bank this Saturday to deposit into our vacation account. We decided in June what we would do with the money. We have a couple ideas in mind for our Fall vacation, either a nature getaway here in Ontario or a long weekend in Las Vegas, depending on how the Canadian dollar is doing. Either way, it feels great to be planning a mini vacation together, and already having the money for it. We'll be doing the challenge again this year.